Even though asbestos has been on the public health radar for decades now, it is still legal to use in many manufacturing processes in the U.S. today. The federal government has regulated how it can be utilized since the decade of the 1970’s. While it may not be processed and sourced in America any longer, manufacturers still work it into such common apartment construction materials as vinyl floors and cement pipes. We will look at the history and dangers of asbestos in New York City apartments in greater detail in this article. 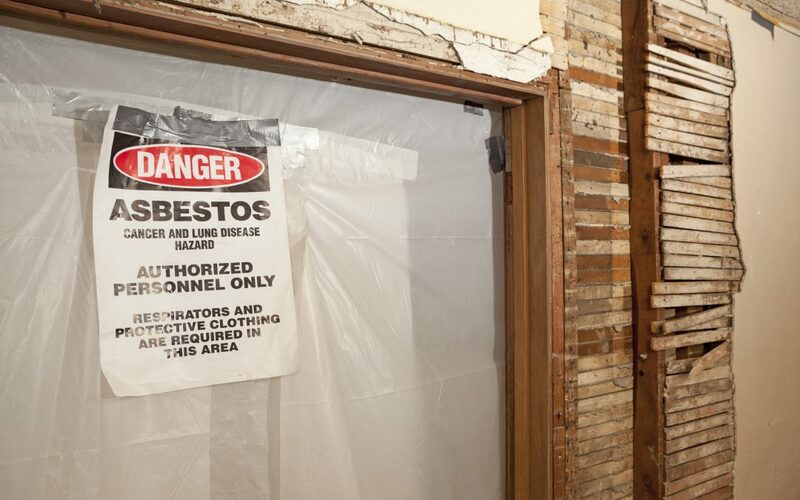 If you suspect that your particular apartment suffers from unsafe asbestos exposure, you should call a professional or the NYC Department asbestos investigator. It is a sad comment that the history of the Big Apple follows the fortunes of the mineral asbestos so well. While there were a number of asbestos companies NYC, the company that popularized asbestos was a New York City firm called the H.W. Johns Manufacturing Company. Established in 1958, it quickly became successful for employing asbestos in fabricating construction materials that were ideally suited for building and insulation because of the fire-resistant nature of asbestos. The profits in this industry were built on the ruined health of countless residents and workers of New York City. Today the city enforces stringent NYC asbestos rules. First rising to widespread fame as a key component of navy ships in the Second World War as the New York City shipyards cranked out warships, asbestos helped to both fireproof and insulate these American vessels. The state factories continued to mass produce asbestos products in the economic boom that followed World War II. Factories throughout New York state and city ensured this highly toxic mineral’s demand remained high. Corporate moguls made fortunes covering up the awful effects on health from exposure to the poison metal asbestos. Sadly this was long before the days of NYC asbestos regulations.Dr. Irving Selikoff gained his place in history for unveiling the dangers of asbestos to the public. In the 1960’s while he worked at Mount Sinai Medical Center of NYC, he researched and released his discoveries on diseases that stemmed from asbestos exposure. Thanks to his earth-shaking revelations, the EPA enacted a range of national safety rules and regulations on the use of asbestos, though they did not outlaw its use. It fell to the successor company of H.W. Johns Manufacturing, Johns Manville, to establish the first asbestos settlement trust in America in 1988. This precedent established the first of countless trusts that other New York companies have since modeled. In theory asbestos only turns dangerous when it becomes released or airborne. Unfortunately, there are all too many ways that this can happen, both outside of and inside your apartment. As one example, a steam pipe explosion a few years ago released asbestos into the air and potentially contaminated apartment buildings nearby. Asbestos release is particularly prominent and perilous when materials that it makes up get destroyed. This causes asbestos to be airborne, as the damaged asbestos items will emit the dreaded asbestos fibers into the air. Blown ceilings that contain the material will release these fibers when workers patch or drill them. Deteriorating asbestos insulation (surrounding furnaces, boilers, and pipes) emits asbestos dust. Ceilings that are not well-maintained can release asbestos with ceiling fan produced air movement. Drapes that contain asbestos spread the dust when you merely open or close them. There are even asbestos transite pipes. They move water into houses and apartments. The transite contains asbestos that deteriorates with time. These fibers from asbestos can easily pass into the water traveling through the pipes and become toxic particles in drinking water in New York City apartments this way. It is continuous exposure to such asbestos fiber particles that creates the risk of cancer. No one anymore even disputes the established claims that long-lasting, continuous exposure to asbestos leads to pharyngeal cancer, lung cancer, ovarian cancer, mesothelioma, and asbestosis (physical scars on the lungs), according to Dr. Philip Landrigan. Dr. Landrigan is the occupational physician and expert on asbestos health effects at the Icahn School of Medicine in Mount Sinai Medical Center in New York and Boston College’s Global Public Health Program Director. For those who smoke and are exposed to asbestos the danger is far greater. Dr. Landrigan has warned that smoking greatly multiplies the chances of getting lung cancer after a person has become exposed to asbestos. Unfortunately it is not always easy to realize that asbestos has been released in your apartment unit or apartment block building. It can be painfully obvious in the cases of 9/11. As he World Trade Center imploded, literally hundreds of tons in asbestos permeated the air of Manhattan. It is highly likely that not only the first responders but also residents of apartment buildings nearby and individuals assisting with the cleanup efforts breathed it in. It will take many grim years before the longer-term effects of such lethally high doses of exposure to the asbestos fibers become obvious. For apartments and apartment buildings though, a mere visual inspection will not thoroughly uncover the presence of asbestos, let alone the potential release of its fibers into the air. This is why samples from such suspicious materials that may contain releasing fibers have to be packaged up and dispatched to a certified laboratory to be carefully analyzed. There are two sanctioned methods for analyzing such materials for asbestos. PLM is Polarized Light Microscopy while TEM is Transmission Electron Microscopy. It is easy to find a suitable certified asbestos testing lab NYC to conduct these tests. You can go go the website of the National Institute for Standards and Technology to find the list of firms that perform the PLM and TEM analyses. The American Lung Association strongly recommends that you retain a professional like a certified asbestos inspection NYC worker to gather potentially harmful asbestos samples for asbestos testing NYC. This will allow you to reduce the likelihood of dangerous asbestos exposure for your family. NYTDR offers asbestos testing NYC. Should any swab tests of your apartment building in NYC reveal that building surfaces are contaminated with asbestos then the Department of Environmental Protection seals off all areas that need to be decontaminated while the EPA brings in people to do asbestos removal NYC. You can take stronger precautions still. If you fear that your apartment has been contaminated by asbestos, you can wear filter masks when you clean. If you elect to do this, remember that surgical masks do not impede tiny particles. You would have to get a N95 mask that is approved and recommended by the National Institute for Occupational Safety and Health. You can purchase these easily at your local hardware store or Home Depot. These are the safety masks that carpenters swear by in their daily work.